Today I was going to post another shortbread recipe, but since I already sort of posted this one…sigh…it seemed like a better idea to make this one official. One of these days I will stop accidentally publishing my drafts. Shortbread recipe tomorrow – unless I click the Publish button today my mistake. Do you remember the scene in The Gladiator where Russell Crowe is walking through a field of tall, golden wheat, his fingers almost lovingly brushing against the heavy seeds? Kel calls it The Crowe Walk. It’s a mesmerizing and beautiful scene (I won’t mention the other scenes into which it cuts). The soft, surreal serenity of the walk through the wheat – so peaceful. Kel and I jokingly replay it in our fields when the grass is especially high. What does that have to do with this post? Not much, except that I’m growing wheat – wheatgrass, specifically – but mine will never get high enough to go to seed, let alone for me to stroll through. I recently acquired a Vitamix, something that has been on my Wish List for a long, long time. My old, cheap-o blender has been crying in the corner ever since. I’ve used that Vitamix every day since it arrived, determined that Kel and I will have at least one green smoothie each day. Along with my Vitamix, I ordered up a 5 lb. bag of wheatgrass seeds from from Todd’s Seeds via Amazon. I planted my first batch not too long ago and watching them sprout and soar upwards – I can almost see them grow – has been a lot of fun. At the time I decided we would be consuming at least one smoothie per day I also decided we needed to be drinking wheatgrass each day. 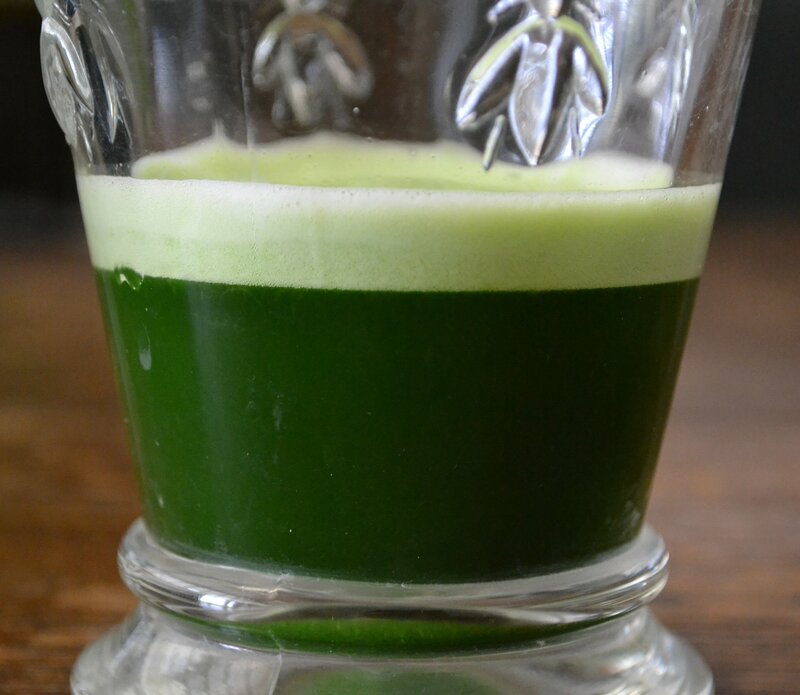 Wheatgrass, when harvested in its peak nutritional state (at about 7-11″ high) is loaded with chlorophyll. Chlorophyll provides energy, helps normalize blood pressure and also helps alkalize the body. According to some research, if the body is high in acidity (i.e., from eating meat for example), it is more susceptible to cancer. Here’s a quick rundown on how I got started and what the process looks like. Rinse a handful of seeds and put them in a bowl or container and cover with water to about 2″ above seeds. Soak them for 8-10 hours and then change the water and soak again. I did a total of three overnight soaks. At that point, tiny little roots began to appear on the ends of the seeds. I used a window box because that’s what I had – but a larger, flat tray would be ideal. You want something with drainage holes on the bottom. (Todd’s Seeds provides instructions on their website.) I filled my tray with a mixture of compost soil, peat and hummus. Avoid soils with added chemicals. I “mudded it in” real good (watered it) and sprinkled the wheatgrass over the top of the soil and then covered the seeds very lightly with additional peat and hummus. Then I gently watered again. It’s important to keep the soil moist, but not soggy. Watch them grow – and water. These suckers germinate and grow fast! Be sure and keep the soil moist, but again, not soaked. I kept my container out of direct sunlight; these guys are delicate. Water 2-3 times per day using a spray bottle rather than a watering can. Ready to cut and juice. By the seventh day, my wheatgrass was ready to harvest. Using sharp scissors, I cut a thick handful of the grass and put it in my Vitamix along with about 3/4 cups of filtered water. There are wheatgrass juicers out there, but after shelling out for a Vitamix there was no way I was going to spend another $50 on a wheatgrass juicer. YouTube is loaded with videos demonstrating how to juice wheatgrass. Keep in mind this stuff is very fibrous – and you don’t want to drink/eat the fibers. Good for cows, not so good for humans. Once I processed the wheatgrass I poured the mess through a fine-meshed strainer. Compost the fiber and either drink the juice straight-up, or combine it with fruit and make a delicious, tangy, super-healthy smoothie as in the recipe below. I plan on getting 2-3 “harvests” from my wheatgrass before planting a new batch. Haha – catnip, wheatgrass – it’s all the same! I’m normally death to plants, but this worked out really well. Maybe because I don’t have to keep it alive for too long ;-)! Cats love wheatgrass! If you buy “kitty grass,” that’s what you’ll be getting. Sprouting is great! Now just add some soil and you’re there ;-)! Such a wonderful emerald color! I have had luck growing wheat grass, but it was for my cats too. HA! We shouldn’t deprive our cats of chlorophyll either ;-)! GORGEOUS photos, Ann! I’ll have to grow me some wheat grass for my raw juicin’ and smoothien’! Looks simply divine! Isn’t it a beautiful color? You just know it has to be good for you! I’ve been around the block with wheatgrass and alwaus have had a terrible time growing it – yours looks amazing! It’s a wonder green for sure, and I always say we should get back into it….it’s got to be worked up to! Great post Annie! Haha – oh, I’m sorry about your wheatgrass woes! Honestly, I have the blackest thumb. I was 95% sure it would fail, but those little boogers grew like champs. Next batch? Who knows! Thank you! I’m kind of amazed it worked ;-)! You’re making it look too easy!I definitely need to pick up some wheatgrass and start juicing it!!! It IS easy (otherwise I probably wouldn’t have done it)! Fun, too. Looks very lush…I should grow some for the dog, actually. She loves eating a bit of grass, but the cat ignores it. The catnip, on the other hand…! Wonder if our dog would eat it. Caught him eating mulberries today so I guess he’s got a sweet tooth ;-). What a satisfying thing to grow – all that green in only a week! It looks very healthy and I bet it’s doing you a lot of good. It’s exciting to be finding different things to mix it with to make delicious smoothies too, I can see why you love your Vitamix! Haha! Well…let’s not put a number on it ;-). I can totally understand, though, the green is gorgeous. I bought a wheatgrass kit and a juicer for a friend a few years ago. It was so much fun to watch this grow and to have wheatgrass anytime I wanted. I do miss this indeed. This would be perfect for starting my day right. I couldn’t wait to get a blender so I can give this recipe a try. Wheatgrass! Super easy to grow. For those who have not had any luck, make sure you buy the soft wheat berries. The other kind doesn’t work as well. The seeds are so “sprouty” I have grown them in a plastic tray with a wet paper towel. No soil needed! Cool tip! I’ve heard that about the paper towels – great if you don’t want to mess with soils. I love wheat grass shoots! Excellent, Anne! I’m starting my next batch today! As soon as I buy that Omega juicer, I plan on doing exactly this (The Vitamix is also on the list). The color is strikingly fabulous, too. Thanks so much for posting this, Annie! Isn’t it gorgeous?? One thing I didn’t mention about wheatgrass is it helps with digestion. I had my first shot of wheat grass last night at a juice bar. I thought I was going to be disgusted and had a chaser of carrot juice waiting. I was pleasantly surprised and didn’t need the chaser. Woot Woot! So gotta start growing my own. I have the champion juicer and it does wheat grass. Thanks for the inspiration. Gotta keep those cancer cells from sprouting!!! Holy crap, I thought I needed special wheat grass seeds. I have been doing a little research and it turns out I have over a hundred pounds of wheat and kamut that I can use from my food storage!?! I’m totally freaking out! So awesome, talk about being prepared for a health or food crisis! Yeah for crazy religion! Ha ha! Naw – just your regular ol’ wheat! Cool, huh? Don’t tell anyone, but some of us Okies are prepared, too ;-)! Busting a gut here! It makes sense, no? Never know when a disaster is going to strike. Totally! I’m no Boy Scout, but “be prepared” is my motto! Plant ’em! Plant ’em! How exciting! Awesome! I’m using some organic Kamut. It’s my freshest so I thought it would be the best to experiment with. Planting now! I know, right?! It’s just…grassy! I’m loving it. Bonus is that it helps with digestion – both Kel and I totally notice. Love it!! I really needed that this week, all the stress I had been through made my gut a mess. It reminded me that I still have an autoimmune disease and that no matter how good my diet is I still need enough sleep and probably some yoga too. BALANCE, Somer, Balance!